According to the latest women in engineering statistics from EngineeringUK 2017 report “women make up only 1 in 8 of those in engineering occupations and less than 1 in 10 of those in an engineering role within an engineering company”. Would having more women engineers help tackle the critical shortage of engineers that the UK is now facing? Certainly. So why are we not seeing more women undertaking engineering professions? It seems the issue stems from a general belief that engineering is a male-dominated arena. Katie, a Process Engineer currently working for the Coal Authority water team of the UK government recalls getting some somewhat sexist comments such as: “are you the secretary?”. One can wonder how in this day and age these types of remarks can still be made but Katie highlighted that they mainly came from more mature engineers with less experience with females in their environment. We see many initiatives across the country aiming at attracting women into engineering, which could be a way to fill the threatening gap of qualified workforce in engineering industries such as construction, civil engineering, utilities, energy and power. Organisations such as the Women’s Engineering Society (WES), campaign to encourage women to participate and succeed as engineers, scientists and as leaders. WES organises a series of events to raise awareness of gender equality issues such as the #9PercentIsNotEnough Conference and Workshops event taking place on the International Women in Engineering Day at the IET Institute. At Anglo Technical we feel that as a provider of talent solutions, we have a responsibility to leave a positive legacy of growth and opportunity in the industries in which we operate. Our commitment to sustainability, gender equality, diversity and ethics defines the culture of our organisation and our approach to business. We strongly believe that diversity in the business is a necessity because a more diverse workplace means ideas are properly tested, are challenged and better decisions are made. Diverse firms are also shown to recover more quickly after periods of downturn. As a business, we acknowledge that this is a problem with the industry as a whole – less women begin careers in engineering – however, in order to raise awareness and tie this into our strategic framework, we are in touch with the likes of Engineering UK and Athena Swan, two organisations which work towards the careers of women in science, technology, engineering, mathematics and medicine (STEMM) in higher education and the job market. At Anglo we try and help our clients towards remedying any inequality in their workplace by firstly including equality and diversity in recruitment and promotional procedures. Non-discriminatory language is always used in our job adverts and age or race-related criteria is avoided so that vacancies are marketed to all people. We have asked some of the women engineers we placed in the past to give some advice to young women who may be contemplating a career in engineering. Katie, Water/Wastewater Process Engineer, warned that in such male-dominated environments, a female should “be prepared to work in a way that men understand"; by this she meant that she has often had to adapt her style to who she was dealing with and to remain as flexible as possible in how she approached people. Katie added that although “women bring big advantages to the industry, it may not be recognised by men”. 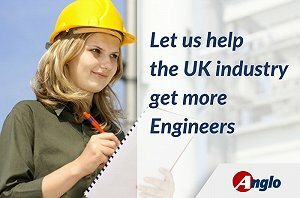 Browse all our Engineering jobs here.